This steps through an simple example of requesting access for a password. Admins can setup a simplistic implementation of 4-eyes principle" / "two-man rule"
Consider giving the action to Full and Read-only, and both Action & Grant abilities to the other Access Levels. 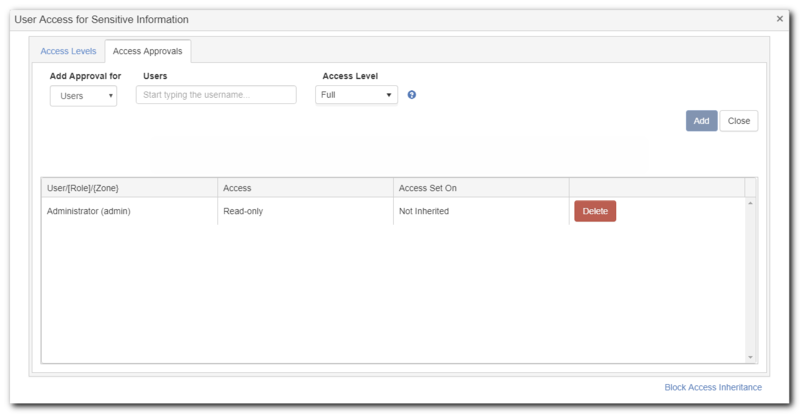 Set Request Access = true for Full + Grant + Block (so administrative users can assign this new access level below). In the Home screen, navigate to the folder(s)/entries you wish your users to be able to request, and assign them the Request Access permission on those items. But although the users can open the entry, they will not be able to view the password or entry contents in the Web client. (Note: However, in the KeePass client some entry content information will still be visible in the Entry list or Preview pane such as the Notes, Title, and Username. This will also be restricted in an upcoming release, to align with the Web client).